If you're facing a week with the kids now that Christmas is over and didn't make plans, check out ArtsBoston for half price tickets to arts and cultural events. The 7th annual Mayor's Holiday Special still has many venues through the beginning of January. One event that caught my eye was the Sing-Along Sound of Music at the Regent Theater in Arlington, MA. With our family's recent obsession with the Sound of Music, I thought this would be a perfect place to see how Adam's high notes stack up with the best of them. The description of the event was downright hysterical. Have you ever been to a film musical and had the uncontrollable urge to burst into song? Yes! Have you always wondered what it would be like to wear a wimple? Gah! Sing-a-long-a Sound of Music is your chance to test your vocal range with several hundred other assorted nuns, Von Trapp family members and Julie Andrews look-a-likes. The evening begins with a live show in which your host will lead you through a vocal warm-up, judge the fancy dress competition and award the prizes. Costumes are not compulsory but they are highly recommended and you will be amazed at the inventiveness on display. The host will then show you how to use your free goody bag throughout the film and suggest some appropriate heckles and accompanying actions (such as hissing the countess, barking at Rolf and, of course, cheering for Julie). Then, you sit back and watch the original 1965 movie in glorious Technicolor™ with the lyrics for all the songs on the screen, so you won’t miss a chance to sing your hearts out. The audience takes over as the star of the show from this point and almost anything can happen – the first rule of Sing-a-long-a is THERE ARE NO RULES! When I read this description to Doug, he called it the "Rocky Horror of Sound of Music, bring your own rice". You can be sure that this would be a mom and kids only event for this family. I immediately thought that I could dress Dova up in braids as Marta since they are the same age, although she likes Liesl the best. Adam would have to grow some blond hair to be Kurt or Friedrich, and I'd have to fashion some chintz liederhosen for him, although he hates dressing up in costume. Anyway you slice it, I would make a terrible Asian Julie Andrews. But we'd all have fun belting out those high notes. 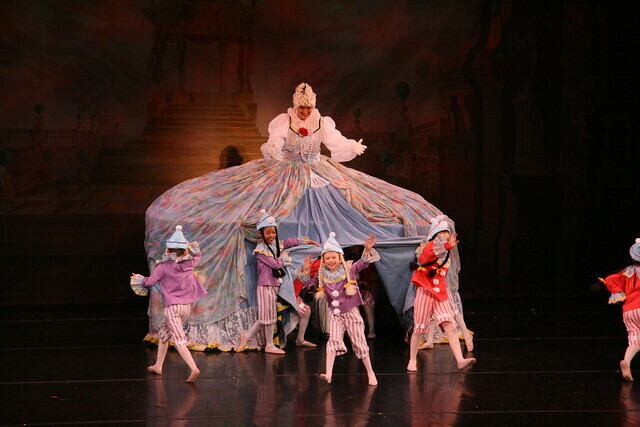 If you're not into interactive arts, there's always the timeless classic of Boston Ballet's Nutcracker. For school vacation week, there are kids activities and special performances. Earlier this month, we took the kids to see the José Mateo Ballet Theatre production of the Nutcracker at the Brandeis University Spingold Theater with half price tickets courtesy of ArtsBoston. With free parking and more affordable prices, I thought this would be a better introduction to ballet for the kids than a longer drive into Boston with traffic and parking to contend with. For the week prior to the ballet, I immersed the kids in Tchaikovsky's music from the ballet, so they knew all the numbers from around the world. Adam was dead set against enjoying the ballet, but once it started, he was completely mesmerized at the edge of his seat. Dova was in her element, except for a tantrum over her dress, or lack of one. 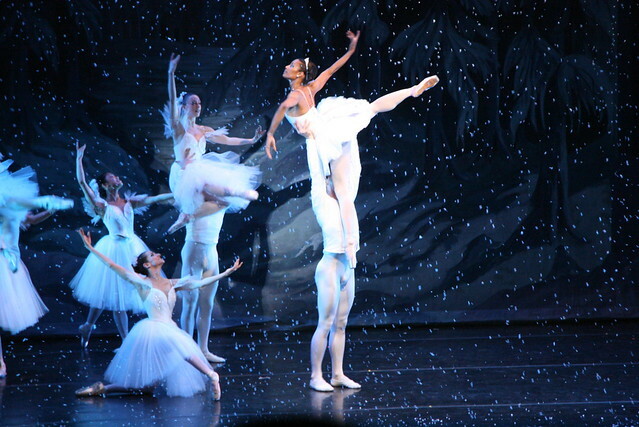 Doug said that it was the best performance of the The Nutcracker that he's ever seen. It was more intimate, unpretentious and you could really enjoy the purity of the performance. Of course I very quietly captured these scenes from the ballet. After you dig yourself out of the upcoming blizzard, I hope you can make it out to a cultural event through ArtsBoston! Note: This is in no way a compensated post. ArtsBoston is simply a fantastic organization that everyone in the Boston area should know about. 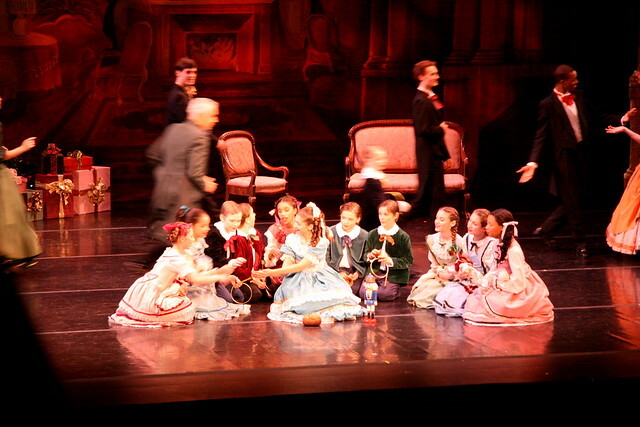 I still remembered that we went to see Nutcracker ballet at Met, Lincoln center ~30 years ago. It showed the little girl looked at the starry stars through a frosty window to trace her lost dream and it was expressed clearly in Tchaikovsky’s music at the end of episode. 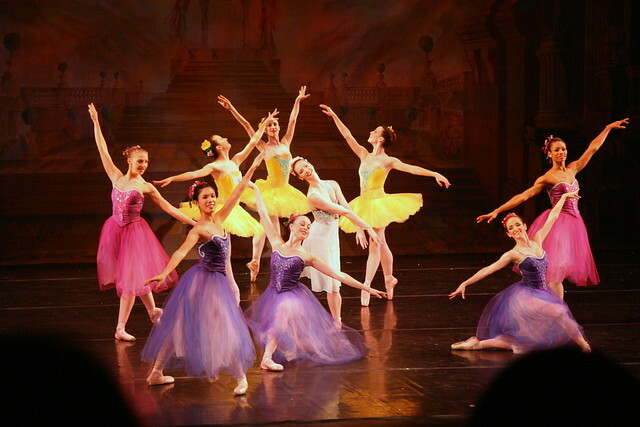 The ballet productions transform into different versions from times to time, places to places. The final episode was often replaced by additional extravaganza of dancing, no more staring at starry night. I am glad Tchaikovsky’s music remains unchanged. It was heartwarming to listen Adam playing the piano version of “Waltz of the flowers” at his music recital. The Nutcracker was a big part of my childhood. Your photos are lovely.